Windows 10 is the Microsoft desktop operating system. Organizations tend to use the Windows 10 Professional or the Windows 10 Enterprise edition. Keeping these operating systems up-to-date and secure can be a hassle. For that reason, some organizations prefer a Virtual Desktop Infrastructure (VDI)* where they can centrally manage the Windows operating system but still providing their employees with full power Windows 10 functionality. * VDI is the solution where the Windows 10 software in installed on a server and client computers connect to that server over the network or the internet. In which way organizations set up their virtual desktop environment determines which type of software licenses they need. Or the other way around, depending on which software licenses for Windows 10 you own, you have a choice of a VDI deployment. EA is the Microsoft Enterprise Agreement (Subscription) and MPSA the Microsoft Products and Services Agreement. Both are (classic) Volume License Agreements for large organizations. OV is the Microsoft Open Value (Subscription), a Volume License Agreement for Small and Midsized Organizations (< 500 devices or users). 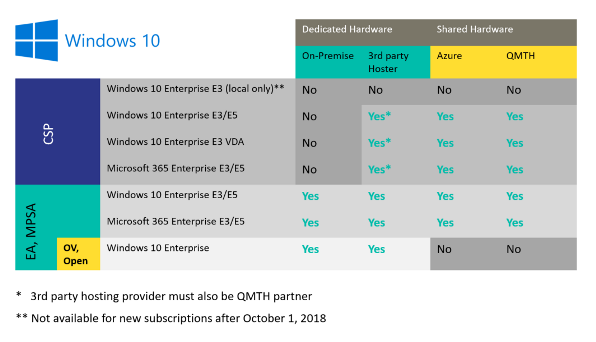 The Windows Enterprise ‘E’ series refer to licenses or subscriptions per user (choose one per user who will use the Windows 10). Without the ‘E’ are ‘device based’ licenses (choose one per device where Windows 10 is used). VDA is a Virtual Desktop Access License, intended for use with thin clients. QMTH is the Qualified Multitenant Hosting Addendum, an extra to the licensing contract for Service Providers (so end customers have nothing to do with that) which grants them the right to install the software on a shared hardware platform. During Microsoft Ignite (September 2018) Microsoft announced the multi-user Windows Virtual Desktop on Azure. Organizations can use their CSP based eligible user subscriptions for Windows 10 and Microsoft 365 (which contains the Windows 10 subscription) for access to the service. The big differentiator with the VDI solution on Azure is that customers do not have to build this VDI infrastructure themselves, Microsoft has done that already. By using existing subscriptions customers only pay for compute, storage and networking within Azure which may lead to a cost saving. Are you thinking about offering the secure Windows 10 environment to your employees but through a centrally managed and flexible infrastructure? VDI might be the solution for your organization. But please be aware of the appropriate software licensing or cloud subscription offerings. Might you have any doubts on your choice or just want to be sure that you pick a compliant but both cost effective solution, please talk to one of our Microsoft Software Licensing Experts.